The Nortel IP Phone 1100 Series encompasses a sleek, cutting-edge, ergonomic design with delivery of innovative capabilities including high resolution, backlit, monochrome greyscale pixel-based, and graphical displays for optimal viewing experience. 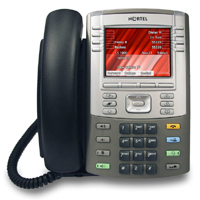 The Nortel 1100 Series IP phones offer support for data and web-based applications, Universal Serial Bus peripheral support for enhanced user navigation, an integrated phone switch with Gigabit Ethernet PC and LAN ports for future-safe investment, integrated Bluetooth®*** audio gateway supporting Bluetooth headsets for enhanced mobility**, a local secure tools menu for simplified administration along with tight integration leveraging the robust suite of features as delivered from Nortel Communication Servers. The Nortel 1100 Series IP Internet Telephones are supported by a variety of Nortel Networks communication systems: BCM 50 R3.0 or later, Nortel Communication Server 1000 with backward compatibility to R4.0, Nortel Communication Server 2100 (initial support with Release SE10), Nortel Communication Server 2000 (SN09U and later), Supported on Media Gateway 1000B Expansion Chassis, Survivable Remote Gateway 50 (R3.0 and later). 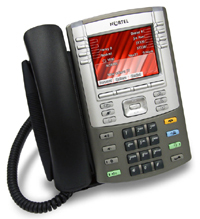 Note: Please ensure your Nortel system is compatible when purchasing 1100 Series IP phones. The Nortel IP Phone 1150e is a multi-line, specialty IP Phone designed for ACD and IP Contact Center environments. IP Phone 1150E supports up to twelve line/programmable feature keys and features seven additional fixed keys dedicated for use by agents or supervisors.The Nortel 1150E IP Phone leverages the IP Phone 1100 Series design and includes high-resolution, backlit, graphical, pixel-based displays, a USB port for navigation and entry, Bluetooth agent headset support and integrated Gigabit Ethernet to deliver superior performance and user experience. The Nortel IP Phone 1165E is a multi-line professional-level deskset with a high-resolution, fully-backlit, QVGA color LCD display. The enhanced configuration menus and USB peripheral support of the Nortel 1165e IP Phone provide a superior navigation experience. The integrated Bluetooth® Audio gateway offers greater freedom and mobilty. The set includes an integrated phone switch with Gigabit Ethernet LAN and PC ports. When the phone is idle users fully experience the personalized background images and capabilities, as well as the Digital Picture Frame mode. The Nortel 1100 IP Series Expansion Module can be added to the 1120e, 1140e, and 1150e IP Phone. The Nortel1100 IP Expansion module allows for up to 18 line/feature keys to be programmed and up to three of these modules can be added to an 1100e series desk phone for a total of 54 buttons of expansion.This module features a High-resolution, 118 x 414 pixel, graphical, backlit eight-level grayscale display and a continuous angle tilt-stand matches angle of IP Phone with tight integration with Nortel Communication Server feature sets.